The day we left San Francisco was the Labour Day holiday, and not a lot was open. If Herbivore had been open I’d have happily gone back for breakfast, but it wasn’t. Instead we headed to a small coffee/bar place near our hotel called Vinyl where we had the BEST soy latte of the trip so far and a bagel with some hummus. Good old reliable hummus is the vegan standby when all else fails. It was yummy. Luckily we had time to fit in Gracias Madre for lunch before heading off to the airport. 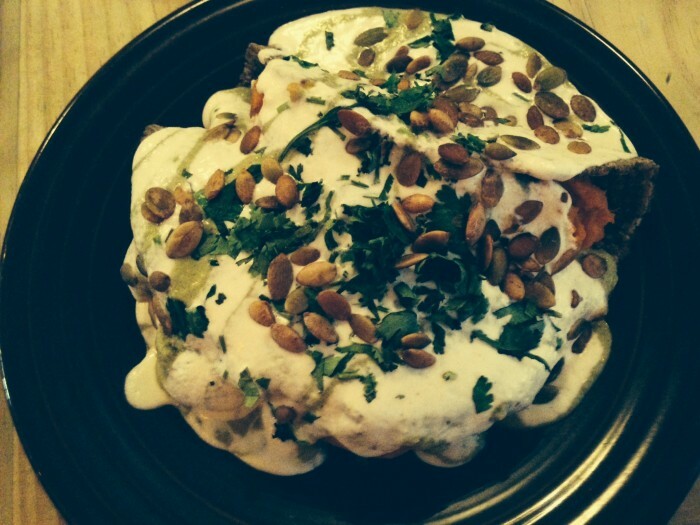 Gracias Madre is another all vegan place serving delicious Mexican food. It had come highly recommended. We’d been unable to get in on the Saturday night before, as it was crowded, with hour long waits, but on the Monday we were unfashionably early and in luck. In our excitement at there being so many choices we over ordered, but that was ok because we took some of it with us to supplement our DIY airline meal. 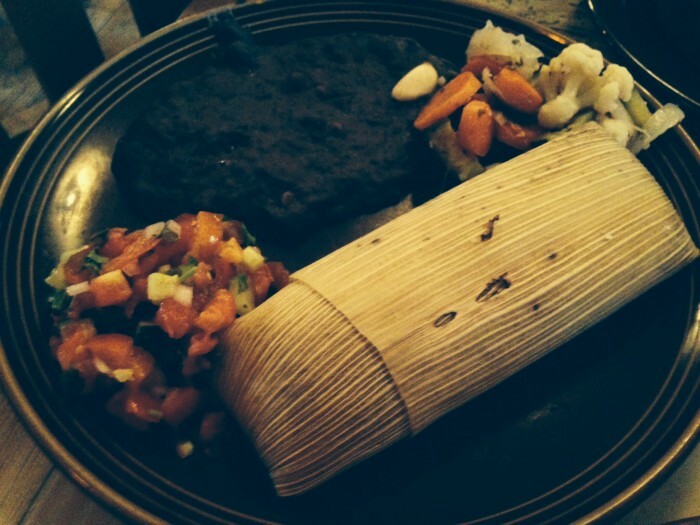 Tamale – stuffed with zucchini, onions, garlic and grilled corn and served with black beans and tomato, onion and coriander dice. This was my least favourite dish, perhaps I’d been spoilt by the utterly sensational version I’d had at Millennium, but I thought this was a bit bland. Quesadilla – sweet potato and caramelised onions in soft tortillas with cashew nacho cheese and toasted pumpkin seeds. Delicious but we were defeated by its size. 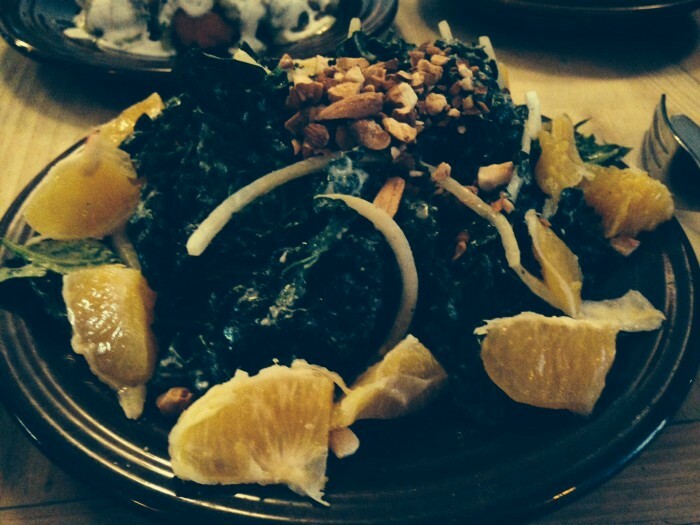 Kale salad – this was delicious. Massaged kale (who massages kale?) with a creamy orange chipotle dressing, orange segments, and toasted almonds. 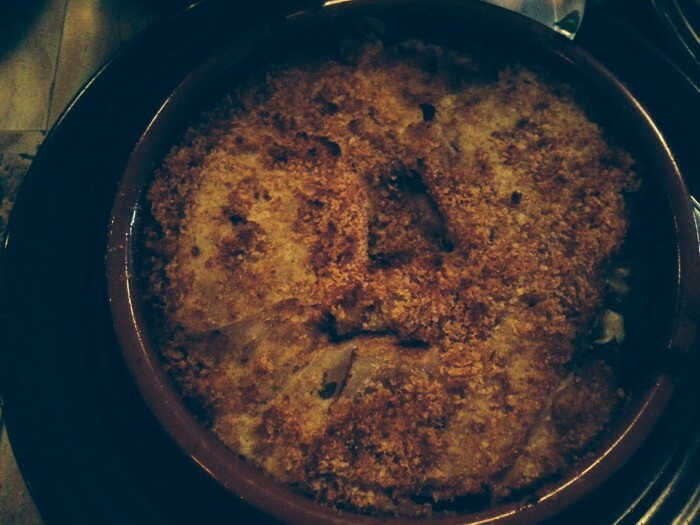 Baked eggplant – I deliberately left the best to last. This is a dish on a shortlist to take to a desert island. One where you would discard all manners and fight your dining companions for the last scraping of it at a shared meal. Roasted eggplant, tomatoes, onions, poblano chillies baked in cashew cheese with garlic breadcrumbs. Soft, unctuous, full of flavour and utterly delicious. I must try to make it at home. Sounds like the food is pretty good 🙂 Enjoy New York!